Pros: The interaction between the DJ and the protagonist was very effective, particularly in showing snapshots of the woman’s life as a soldier alongside her night out in the club. Cons: Occasionally I just felt a bit lost. While not always a negative in theatre, in this instance it happened one too many times. 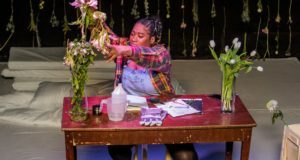 Overall the show felt slightly unpolished, which was a shame as some of the ideas established, alongside the brilliant music, could lend themselves to a very powerful performance. Etcetera Theatre can be found above a pub in Camden, and I found it to be a friendly place where I enjoyed an entertaining exchange with the bartender (he thought I was asking for the toilets when in fact I wanted a gin and tonic). The theatre itself is a good space with tiered and relatively comfortable seating – although legroom is limited. Passion describes itself as ‘a solo rave’, and forms part of Etcetera Theatre’s WIT (Women in Theatre) Festival. It is an intriguing show about a soldier, Edan, who loses herself and her inhibitions on a night out. It begins with the promised solo rave, with the live DJ adding a special touch to the performance. We see Edan (Helen Cuinn) put on make-up and get herself ready for the evening, followed by a sequence in the club. This action was cleverly depicted, although some of the sections went on for slightly too long to fully engage me. A particularly good section was that in which Edan stepped outside and had a conversation with a stranger. This sequence was repeated and slightly modified as her night progressed and her state deteriorated. Edan spoke directly to audience members, although when one audience member replied she stuck to her script. Perhaps with such direct questions she should be prepared for the more gutsy audience members to engage directly! The most effective aspect of the show for me was the close working together of Edan and the DJ, and the juxtaposition of the present and the past through their multimedia performance. This was particularly powerful at the point when the club music was integrated with the sounds of war, especially taking into account the knowledge the audience had of Edan’s former life as a soldier. Marching boots and violent sound effects made us realise we were not in the club anymore. During a short fight sequence when Edan’s actions corresponded with the sound effects created by the DJ this synchronicity was really effective. The DJ (Joshua Payne) deserves a special mention. He played a brilliant set, which would work just as well outside the context of the show, in a real club. Having the live DJ there added another dimension to the show, and being visible to the audience made him just as much part of the performance as the actress on stage. The show particularly focuses on ecstasy and how Edan takes it to escape from her time as a soldier; using the state of euphoria to shield her consciousness from memories. With further development this show could focus more on the effects of war on soldiers, and how they cope with these effects once home. However, it felt as though every time this subject was being explored the show moved on too quickly. Passion is a play full of great ideas and with some development could be incredibly powerful. However, there were a few accidental prop mishaps which broke the atmosphere, and I occasionally felt lost. Overall I was engaged in the show, just not entirely satisfied on leaving the theatre. 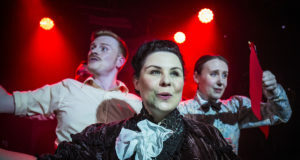 Booking Until: Passion was only running for one night at Etcetera Theatre, but is being performed with The Vault Festival Waterloo until 8 March 2014. The WIT Festival at Etcetera Theatre also runs until the 8th March. Lily graduated from the University of Surrey with a Music Degree and has worked in a variety of cultural spots in London ever since. She is currently at Chelsea Physic Garden but previous jobs have included an intriguing year working at the Horniman Museum and Gardens with an overstuffed walrus and in the press team at Battersea Arts Centre which opened her eyes to theatre she'd never been brave enough to attend before. Ever since, Lily has found herself becoming more and more adventurous, and has even braved the odd immersive theatre experience, although police charging into a warehouse in Hackney and pushing her out of the way may have been a step too far.